This article is about Lucas' appearance in Super Smash Bros. Brawl. For the character in other contexts, see Lucas. Lucas (リュカ, Lucas) is a playable character and newcomer in Super Smash Bros. Brawl, becoming the second installment in EarthBound characters. He is the main character of Mother 3, the Japan-only sequel to EarthBound. Lucas' special moves are similar to Ness', but his physical attacks are almost all completely different. He relies on his PSI powers far more than Ness, using them for all but his forward smash, up aerial, down tilt, and standard combo attacks. Lucas uses Duster's Rope Snake from Mother 3 to perform a tether recovery. The Rope Snake is also a taunt, where Lucas looks at the snake and argues with it. Lucas also utilizes Duster's Rope Snake for his grabs, giving him a ranged grab, much like Link, Toon Link, Samus, and Olimar. Like Ness, all of his special moves, as well as his Final Smash, derive from in-game attacks that are instead learned by another character, in his case, Kumatora, not Lucas himself. Lucas currently ranks 30th on the tier list at the very bottom of Lower-Mid tier and the lowest rank of the newcomers. 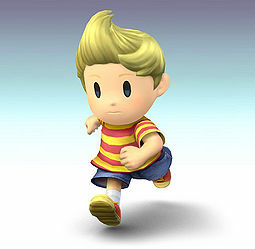 Lucas possesses above average speed and mobility, as well as very powerful smash attacks with fast start-up (forward smash) or very large disjointed hitboxes (up and down smashes), a great and versatile recovery with several options, fast attacks, and multiple attacks that can setup additional blows effectively. However, Lucas possesses a subpar aerial game with some problematic aerial moves (such as B-air) or aerials that are just inferior compared to what other characters possess, a lack of KO moves outside his smash attacks (limiting his versatility in being able to finish off an opponent), and a rather poor grab game, possessing a low reaching tether grab (relative to his peers like Olimar) and lacking any effective setup throws outside of low percents. His most major flaw though, which is often cited as the reason for his low tier placement, is the 10 additional frames of lag he suffers when grab released on the ground, similar to the character he is a semi-clone of, Ness. This makes him vulnerable to grab release followups from nearly every character, as well as a 0-death grab release and an infinite grab release from Marth, and Donkey Kong respectively. Overall, Lucas has generally poor matchups (with four especially terrible due to serious grab release issues from Marth, Snake, Donkey Kong, and Sheik, giving him several hard counters, while being even with the lower-tiered Bowser due to the aforementioned problem), and poor tournament results. Lucas is a character with some slow but strong attacks that have large hitboxes and an average dashing speed. His aerials are generally quick and disjointed (most notably his forward and down aerials), and his back and down aerials can meteor smash opponents. Note that both of his two aerial meteor smashes are hard to hit with in the fact that they can only meteor smash an enemy downwards at a certain point of the attack (the tip of his foot for his back aerial and the fourth and final kick for his down aerial, which is easier to land but weaker). His smash attacks are very strong; his up smash can be charged for massive damage and vertical knockback, as well as having a gigantic hitbox, his forward smash is a strong and reasonably quick smash attack that also reflects projectiles (like Ness's forward smash), and his down smash is very strong and can hit three times, but has a bit of startup lag. Two of his smash attacks (up smash and down smash) tend to have enough ending lag to be easily punished in most situations, leaving him using only his forward smash for easy on-stage kills, which becomes too predictable for KO use. However, his down-smash is among the highest damaging in the game, alongside Ice Climbers, but all three hits would only typically connect if the opponent has some form of knockback resistance. If an opponent is on the platform in Smashville and is vulnerable, the up smash makes a very easy and quick KO. Two of his special moves, PK Freeze and PK Thunder, can be controlled. This means that these attacks both leave Lucas very vulnerable because he cannot move or attack when controlling these projectiles, except for using the projectiles themselves to defend him. PK Thunder is Lucas’s main recovery move. If it hits Lucas, it will shoot him in an angle depending on which part of Lucas's body which it hits, and will deal a large amount of damage if most or all of its hits connect. It also deals reasonable knockback, but is a bad approach. PK Thunder normally goes through enemies and objects, but it can still be interrupted by certain attacks, hurting recovery. PK Freeze can be controlled from side to side and can freeze opponents. It also does a good amount of damage if "charged," but the vertical nature of its knockback limits its use. His side special, PK Fire, is a single hit move that pushes Lucas back a little, making it great for Wavebouncing. It can also be used to Zap Jump, which gives Lucas’s recovery a substantial boost. His down special, PSI Magnet, can absorb energy based projectiles, such as Ray Gun bullets, Fire Breath and even Pikachu's Thunder, and if it used right after PK Fire, can push him back even further (a technique called the Magnet Pull), giving him a great horizontal recovery. His grab range is great and is far longer than many characters' range since it is a tether, but it is quite laggy if it misses. However, his Pivot Grab has much less lag. His throws are also powerful with good KO potential (relative to other throws), most notably his down throw (though up throw KOs soon after and comes out faster, and back throw can be dangerous if the opponent is too slow to react). In addition, his second jump is the 3rd highest in the game, falling a little shy of Ness, who is exceeded by Yoshi. As stated above, the jump can be significantly lengthened by performing a PK Fire one frame after a midair jump has been inputted. Lucas's aerial game is essentially "high risk, high reward". His neutral aerial can be an effective comboing and damage-racking move, but it is not very useful if the final hit fails to connect. His forward aerial is fast and can chain into itself repeatedly, but lacks range. His back aerial very strongly meteor smashes if sweetspotted, but it has very little utility if sourspotted, making it a rather situational move. His up aerial has decent coverage and deals powerful vertical knockback, but has considerable startup and ending lag. Lastly, his down aerial deals high damage and is also capable of meteor smashing, but its very low power prohibits it from being very useful outside of setting up at low percents and gimping with the sourspot hitbox at high percents. Lucas is known for having a good lock setup; if a grounded opponent is hit with the last two hits of his down aerial, it becomes incredibly hard to tech the last hit. This allows for a quick down tilt lock, and then a finisher, which is almost always an immediate forward smash, the most common. A charged up smash also works, and both are guaranteed if performed correctly. However, the forward smash is easier and has almost no risk of failure. This adds to Lucas's limited KO possibilities. Overall, Lucas benefits from a high double-jump, a powerful and quick forward smash, high-damage and powerful up and down smashes, long range grabs and strong throws, the best pummel (damage-wise), a good recovery move in PK Thunder 2 (which, when used correctly, gives good recovery distance and a very versatile angle of recovery), and advanced techniques such as Magnet Pull, Zap Jump, Z-Air Jump, Wave zap and Thundersliding. However, being a victim of 0-death grab releasing by Marth is a major flaw in his game (not to mention Donkey Kong's infinite). He, like Ness, suffers from 10 additional frames of lag when he escapes from grabs, enough to be dash re-grabbed by many characters (although the timing is strict) or open for certain attacks (some, but not many, characters can easily followup with a strong attack, especially Marth, Donkey Kong, and Wario, among others). He is fairly floaty, and two of his smash attacks are slow. However, he has a hard to gimp recovery, since his PK Thunder can travel through opponents and requires less space. He also has many more options, including Zap Jump, Magnet Pull, and Z-air or Z-air jump (done by buffering a jump after an aerial's lag time, then air dodging as soon as possible and using Z-air immediately after). 3% Kicks with his right leg twice, then does a spinkick with his left. 11% (sweetspot), 9% (sourspot) Launches a small burst of PSI energy in front of himself. Can be angled. 3% (hit 1), 8% (hit 2 clean), 4% (hit 2 late) Does an aerial flipkick charged with PSI. Can chain into itself at lower damage percentages. 6% Crouches and spins with his leg out. The tip of the attack can sometimes cause opponents to trip. Very fast and can combo into itself easily. 12% (sweetspot), 10% (sourspot) Lunges forward, sending forth a burst of PSI energy. Deals more damage closer to Lucas. 15% Swings his stick forward. Like Ness's forward smash, it is a reflector, but is faster and deals less damage compared to Ness' bat. 2% (hit 1), 19%, 18%, 16%, 14%, or 12% (clean to late hit 2). Releases a burst of PSI that erupts above his head. It has slow start-up but deals immense knockback and leaves horrid lag afterwards, rendering it very easily punished. Second strongest up smash in the game behind Ivysaur. 17% (hit 1), 14% (hit 2), 11% (hit 3) Points at the ground and shoots three bursts of PSI energy. Each burst deals less damage, but has more range than the last. It's possible to hit more than once if Lucas is on a moving platform, like the one on Smashville, or if the opponent is under the effects of slow motion. Though difficult to pull off, it will do 47% damage when all hits connect and fully charged. 2% (hits 1-7), 3% (hit 8) Spins in a gyro pattern with PSI energy around him. If used in a short hop without the last hit connecting, he can set up a lock at early percentages by footstooling his opponent and immediately using Zair or PSI Magnet to cancel his vertical momentum while facing the same direction as his opponent. Lucas's fastest aerial. 12% (clean sweetspot), 10% (clean sourspot), 8% (late) Kicks his foot forward, launching a burst PSI in front of himself. 12% (meteor sweetspot), 10% (sweetspot), 9% (sourspot), 7% (tip) Sweeps his legs behind him, leaving a trail of PSI energy. Can meteor smash if sweetspotted. Notable for being the only meteor-smashing back aerial in the series, although it has poor horizontal knockback if sourspotted. 13% Headbutts upwards. Decent knockback. 5% (hits 1-4) Stomps his feet downwards four times, leaving a trail of PSI energy. The fourth hit can meteor smash weakly and can also set up a lock using his down tilt, followed by a smash attack, if the opponent does not tech the meteor smash. The attack does not link very properly, due to the first three hits having vertical knockback. 0% Sends his Rope Snake out in front of him. Deals no damage; for recovery purposes only. It can eliminate all landing lag when used in short hops. — Pulls out his Rope Snake which extends and grabs the opponent. Long range and less laggy than other tether grabs, especially his pivot grab. 3% Headbutts the opponent. One of the fastest pummels in the game. 10% Uses telekinesis to launch the opponent in front of himself. 10% Telekinetically tosses the opponent behind him. Very high KO potential, being one of the strongest back throws in the game. 10% Telekinetically whirls the opponent around his head, then throws them straight up. Can KO at high percent. 7% Telekinetically slams opponent down, then launches them upwards after a brief delay. Can combo into up tilt at early percents. Strongest down throw in the game. 6% Gets up and kicks both sides of himself. 8% (leg), 6% (body) Flips onto the stage and does a sweep kick. 10% Slowly pulls himself up and delivers a powerful punch. PK Freeze 10-19% Releases a burst of blue, snowflake-shaped PK energy that can freeze opponents. The direction of the burst's path can be controlled, and the attack can be made stronger by holding the special button. PK Fire 3% (lightning), 5% (fire) Throws a lightning bolt-like projectile that turns into a burst of fire upon contact. Unlike Ness's version, Lucas always fires at the same trajectory, whether it is launched on the ground or in midair. Can be used to perform the zapjump, wavebounce,or the Magnet Pull. PK Thunder 2: 8% (hit 1), 3% (hits 2-6), 2% (hits 7-11), 10% (hit 12) Launches creates a stream of lightning that can be directed into Lucas to launch him. Unlike Ness's version, it doesn't fizzle out after hitting a foe, and causes repeated damage. This also applies to his PK Thunder 2, which can deal up to 43% damage if all hits connect. PSI Magnet 9% (ending), heals x2.5 the damage of absorbed projectiles. Creates a blue energy field in front of himself which allows him to absorb all energy-based projectiles. It can be held in order to use it repeatedly. The orb can damage opponents inside it when the button is released. PK Starstorm 14% (each star) Lucas calls down a rain of stars from the sky, yelling "PK...Starstorm!". Rides in on a Mr. Saturn-style coffee table, then hops off. The table is based on the one that Lucas rides to Saturn Valley in Mother 3. Up taunt: Lucas trips, shakes his head, and gets back up. Side taunt: Duster's Rope Snake taps him on the shoulder and has a brief conversation with Lucas, as Lucas shrugs towards it. Down taunt: Lucas creates PSI sparks with his fingers, moving his arms in a sideways motion. Taps the edge of both of his shoes on the ground. Swings his fists in front of his body in a beating motion. Lucas shouts like his up smash. A fast-paced cover of a portion of the opening theme from Mother. Up: With his back towards the screen, crouching, Lucas does something on the ground with a large stick before turning his head around towards the screen, saying "Hmm?". Left: He bends down on one knee and shoots hexagonal PK shocks from his fingers in the air in front of him. Right: He forcefully pulls one of the large needles (from Mother 3) before the large needle flies off-screen with a trail of sparkles while Lucas looks towards the screen. This is very similar to his Up Smash. Lucas has a poor Matchup Spread overall. He counters 1 character, Ganondorf, Soft Counters 6 Characters, has 7 Even Matchups, Gets Soft Countered by 12 Characters, Countered by 10, and Hard Countered by 4. FAE - Known as a top Lucas main in the U.S.
Mekos - Considered the best Lucas in the world. Also known for his impressive doubles results with the character, placing high at nationals while teaming with a variety of different teammates, earning the nickname "The Doubles God". Oats - Known as a top Lucas main in the U.S. Pink Fresh - Considered the second best Lucas in the United States after Mekos. Taiheita - The best Lucas in Japan. Lucas' 10 extra frames of lag while being grab released, and the extensive chain grabbing it allowed, was discovered very early on in Brawl competitive play. As a result, Lucas perpetually floundered between 27th-30th on the tier list in the low tiers, with minimal tournament results and a small playerbase, since the very beginning of Brawl. Lucas had a few dedicated and highly notable players however, most significantly Mekos, who managed to get unusually high tournament placings with a perceived low tier character; the pinnacle of such being Mekos placing 9th at SKTAR, which was only the second time (after San at Apex 2010) that a player would place in the top twelve at a national using a perceived low tier character (and this would be the last time in Brawl that a low tier player would place that high at a national). The propensity of the aforementioned Lucas players to place significantly higher than their low tier brethren and the best players of some higher ranked characters, as well as occasionally taking sets off of big name players using high tier characters, led to many players believing Lucas was underrated and not the low tier he was always ranked as. While the BBR would finally formally move Lucas out of the low tier in their latest tier list after having ranked him a low tier for five years, they didn't actually increase his placing and he remains only one spot removed out of their low tier at his perpetual 30th ranking. The Japanese however rank Lucas a bit higher on their tier list, ranking 24th there in their middle tiers. Lucas is seen walking alone in an abandoned zoo, until several Primids show up. Then, suddenly, the gigantic Porky Statue appears and chases after Lucas. Lucas runs from it, until he gets caught in a snag and just when Pig King Statue almost has him, Ness comes to his rescue by attacking the statue with a PK Thunder. Ness blows up the Porky Statue with his PK Flash, which reveals Porky Minch himself (based on his Mother 3 appearance). Ness and Lucas defeat him, but no sooner do they do so when Wario shows up and attempts to shoot Ness with his Dark Cannon. Ness dodges each time, so Wario eventually aims at Lucas and shoots. Ness pushes Lucas out of the way and gets turned into a trophy himself. Terrified, Lucas runs away as Wario cackles in the rain. Later on, Lucas runs into the Pokémon Trainer as more Primids show up. After they are defeated, the Pokémon Trainer leaves, but Lucas decides to join him after remembering what happened to Ness. Lucas and the Trainer encounter and defeat Wario in the desert wastelands outside of an abandoned temple, but Lucas gets depressed when Ness is still nowhere to be seen. Along the way, the Pokémon Trainer catches Ivysaur and Charizard. After Charizard is caught, Galleom falls into the ruins, having been knocked down there by Marth, Meta Knight, and Ike. A battle ensues between Lucas, the Pokémon Trainer, and Galleom. After the battle, Galleom grabs Lucas and the Pokémon Trainer, jumping high into the sky and out of the ruins. Galleom then attempts to detonate a Subspace Bomb as a last-ditch effort. Lucas, finally gaining his courage, uses PK Thunder to sever Galleom's arm, causing the two to plummet to the ground. Just before they hit the bottom, Meta Knight grabs the two and takes them to Marth and Ike. Galleom's Subspace explosion engulfs the Ruins along with Wario's trophy. When there, Lucas shakes hands with the Trainer as a sign of their friendship. Later on, Meta Knight leaves the group and climbs the Glacial Peak to retake his ship, the Halberd. The Ice Climbers fall into The Canyon soon after. The group is then ambushed by a horde of Subspace foes. Luckily, Mario and Link's group arrive to assist. The groups then merge and camp out for a while. Then Lucas and the others witness the huge Subspace explosion engulf The Isle Of The Ancients. Then the Falcon Flyer lands with Captain Falcon, Olimar, Samus, Pikachu, Donkey Kong, Diddy Kong, and R.O.B. on it. Alongside it is the Halberd having been retaken by Meta Knight along with Lucario, Snake, Fox, Falco, Peach, Zelda, and Mr. Game And Watch. Lucas and the other heroes confront the Subspace Gunship, and then journey into subspace to battle Tabuu. Lucas is defeated by Tabuu's Off Wave, but later revived by Ness and his companions. He accompanies the heroes into the Great Maze, and can be used to defeat Tabuu at the final battle. Lucas can use any sticker that has a PK attack bonus, similar to Ness, which covers all but his forward smash, down tilt and up aerial. He can also use ice, fire, and electric attack bonuses for his special moves, though Indirect Attack would likely be more effective as using three stickers separately would be inefficient. Lucas's physical attacks are mainly composed of Leg attacks, though his forward tilt is Arm, up aerial is Head and forward smash is Weapon. Event 20: All-Star Battle x1: Lucas is one of the eight opponents fought in this event along with Wario, Meta Knight, Pit, Zero Suit Samus, Olimar, Diddy Kong, and the Pokémon Trainer. Event 21: Visit to Onett: The player controls Lucas and must defeat Ness on Onett. Co-Op Event 3: Fastest, Shortest, Sudden Death: Yoshi and King Dedede must survive for 10 seconds against Lucas and Pit on WarioWare Inc. All players start at 300% for this event. Lucas's main and Final Smash trophies can be obtained by clearing Classic Mode and All-Star mode respectively with Lucas. The younger of twin brothers living in Tazmily Village in the Nowhere Islands. He's a kind boy who can communicate with animals, but he's shy and never really got over the tragedy that struck his mother. He fights a warped dictatorship, hunts the Seven Needles, and crosses swords with his missing brother, Claus. In the end, the young boy with psychic PSI powers grows up. Lucas's Final Smash. He pulls a large group of stars from the sky and sends them smashing down among his enemies, causing damage to one and all. In Mother 3, this move was used by Lucas's traveling companion, Princess Kumatora. As Ness learned this move from Poo, Princess Kumatora taught Lucas when he learned he would appear in Super Smash Bros. Brawl. Super Smash Bros. Brawl is the only game where Lucas is a starter character. Lucas is one of the four characters whose four throws can all KO in Sudden Death. While Lucas' game (Mother 3) was released only in Japan, his in-game voice in Brawl speaks with an American accent, whereas Ness, whose game (EarthBound) was released in North America and takes place in a stand-in for America, speaks using a Japanese accent. Even though Lucas trips over a root in the Subspace Emissary, his foot is seen under it. Oddly, when the Rope Snake is used against a ledge at 1/4 speed, it jerks around while it clings to the ledge and while Lucas is being pulled up. At other speeds, it only jerks around while Lucas is being pulled up (it is unnoticeable at normal speed and 1.5 speed). Also, when Lucas uses the Rope Snake when standing on a ramp or angled platform, his hair will flatten out. Lucas never uses his hands directly to attack, except for his ledge attack (if his damage is more than 100%). Lucas, Diddy Kong, Fox, Samus, and Pikachu are the only characters in the Subspace Emissary to fight more than 2 bosses (excluding boss re-creations in the Great Maze). Lucas can be chosen to fight Porky Minch at The Ruined Zoo, Galleom at The Ruined Hall, and Tabuu in the final battle at Tabuu's Residence. Lucas is the first semi-clone to be a starter character. Lucas' page at Smash Bros. DOJO!! This page was last edited on March 2, 2019, at 18:38.